We are so glad that you are here. At our place, it's all white and we are STILL waiting for the bus! Hehehe...Just a couple inches of snow and Flanders is in grid lock. Of course, the boys are not complaining at all. Neither am I. 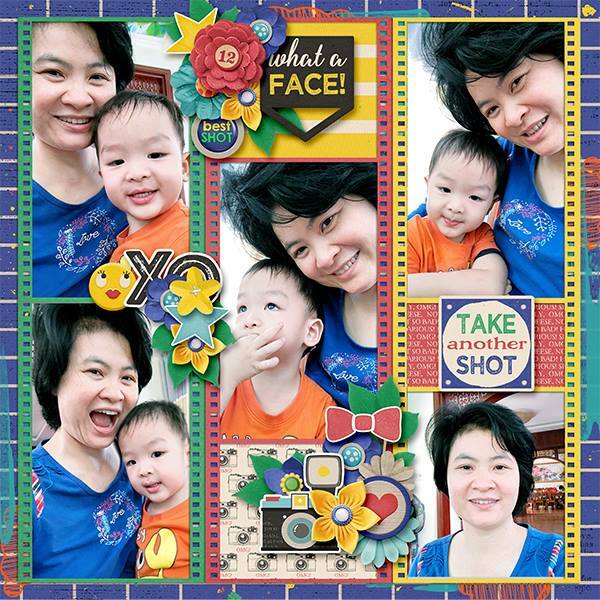 It's great to have bonus time with family. Whether you are enjoying warmer weather and sunshine or you're nestled in your favorite sweat shirt scrolling through your e-mails we are thrilled you've found time for us. 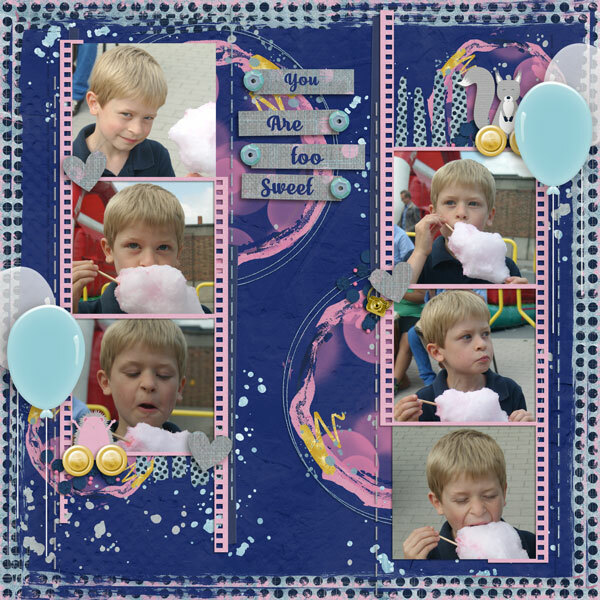 I'm sure you'll love today's blog full of scrapbooking inspiration and freebies. 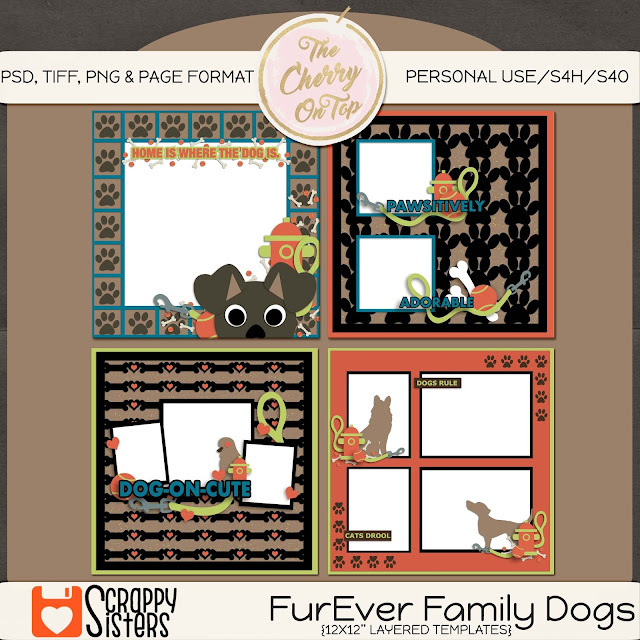 We've got new, pet themed templates in the Scrappy Sisters shop, a gorgeous kit with a free with purchase, coordinating template and a few freebies. Again, I'm providing cuttable files in these templates. If your cutting machines accepts png format, any of our templates will work. Each layer is separate and in png format. There is a file full of the pngs and this one would be the easiest to use for that. 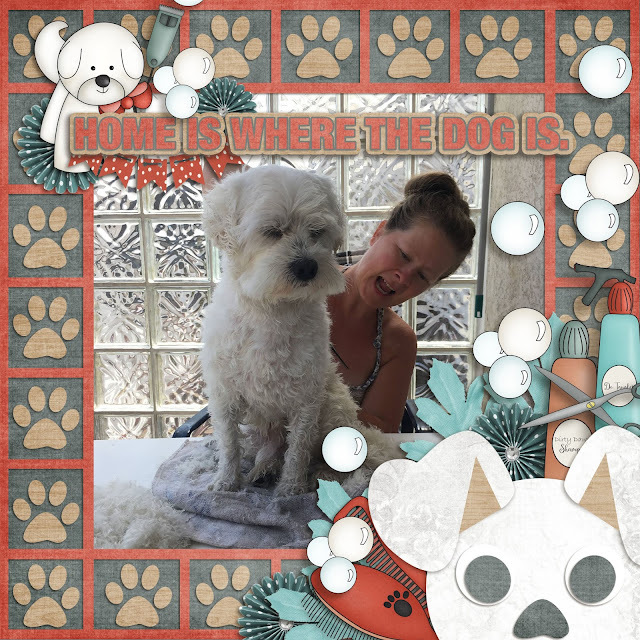 We've got all kinds of animals at our place and fortunately, a lot of people are fans of furry, feathered and other types of beasts. So much so that I'm inundated with requests! 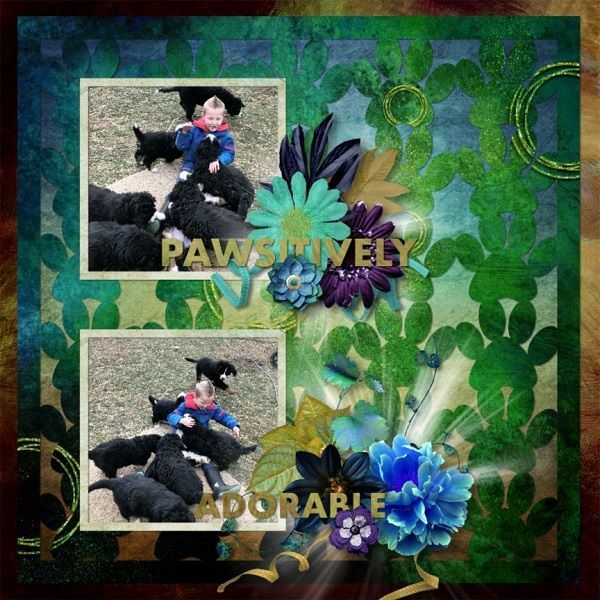 This week we are putting dogs on the throne and next week will be kitties with more animal themed templates later to come. The first three pages are done through yours truly. Check out how I added a stroke around that merged cuttable in a few of my pages. It just felt like it needed an extra aspect. A bit more contrast perhaps? Above, I used our Dog Daze Collection found in the Kreative Design Studio. There are so many packs available for you. 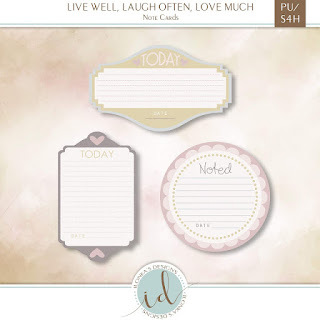 More templates, quick pages, Cute Cards/Journaling cards, elements, papers, word art, stationary...take a peep and see if something is for you. You get a lot of goodies in our elements pack. They go just great with both sets of templates. I really like the paw prints on this template. Again, I gave it a nice contrasting stroke and pimped up that shadow just a bit more than normally. 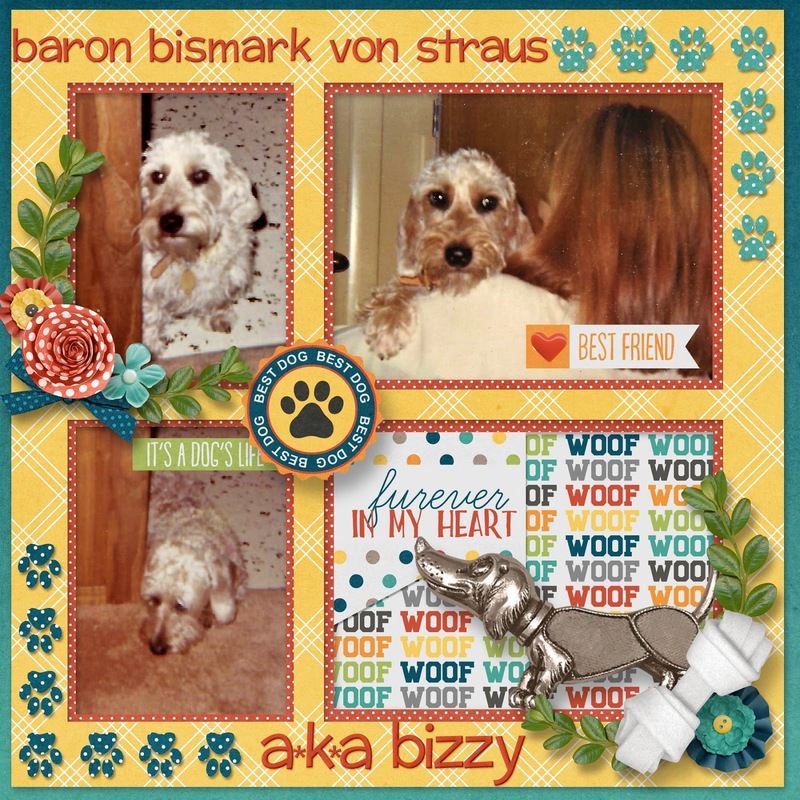 Aimee Harrison's Wooftastic collection has a nice, natural color palette and a lot of dog elements, too. Check out the rest of my team's pages. Ha! Hilary did a great job following the template. 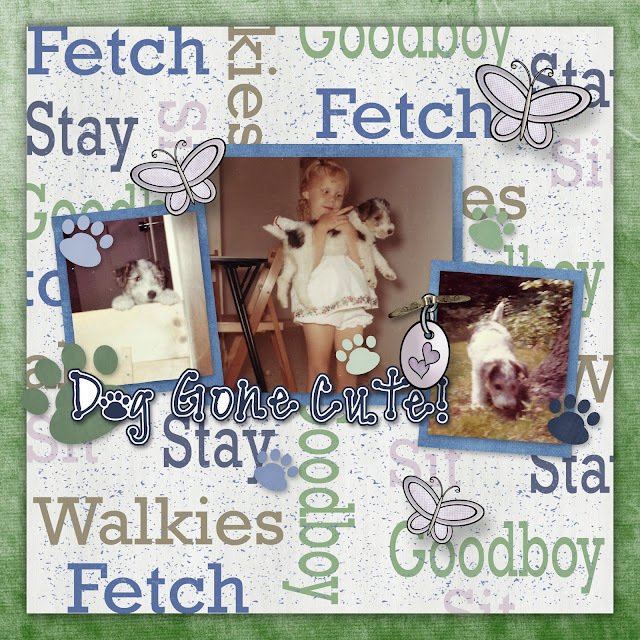 Her little doggie is SO cute and what's fun is you can customize our doggy to look like yours. These templates are so much fun. I hope you decide to add them to your stash. Now, let's look at our newest and first One Word Wonders. The plan is to have a fantastic, over the top awesome kit every other month. Newsletter subscribers will get a mini portion for each of them and the full kits will also contain a coordinating template. My lovely ladies were so into the artistic style template. 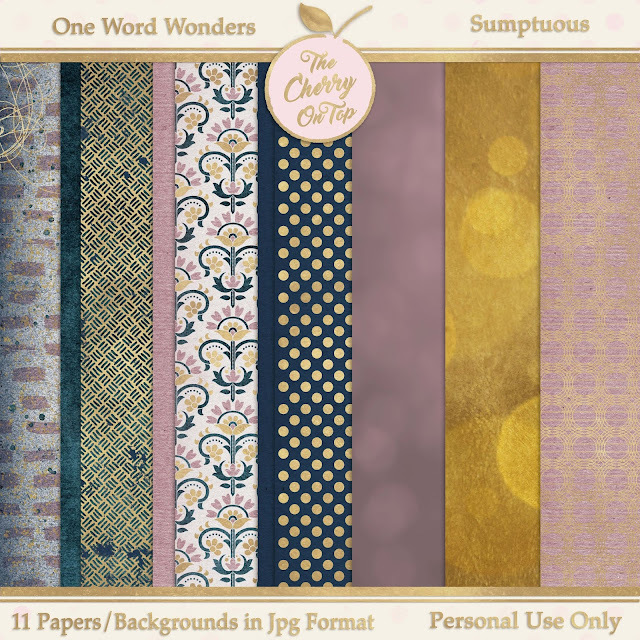 Check out what we've done with Sumptuous and the template. Below, is Jodi's page. 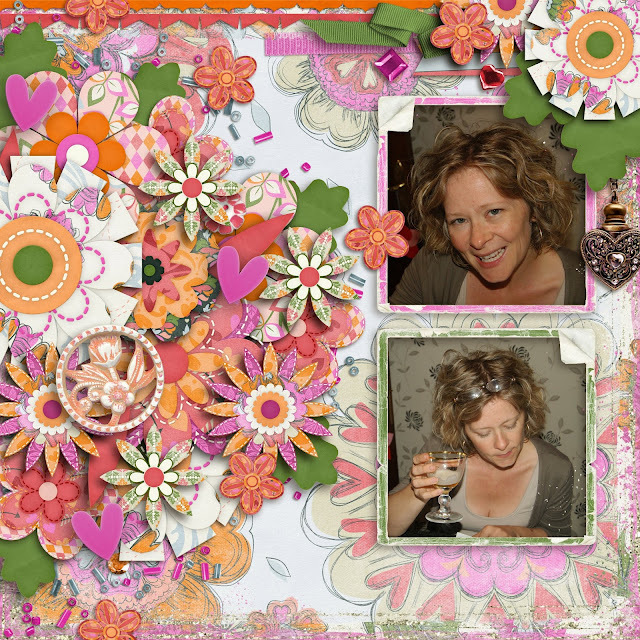 She's used her gorgeous templates, Efflorescence. Jodi's entire collection for this line is totally droolville. Pop over to her store and be ready to be wowed! 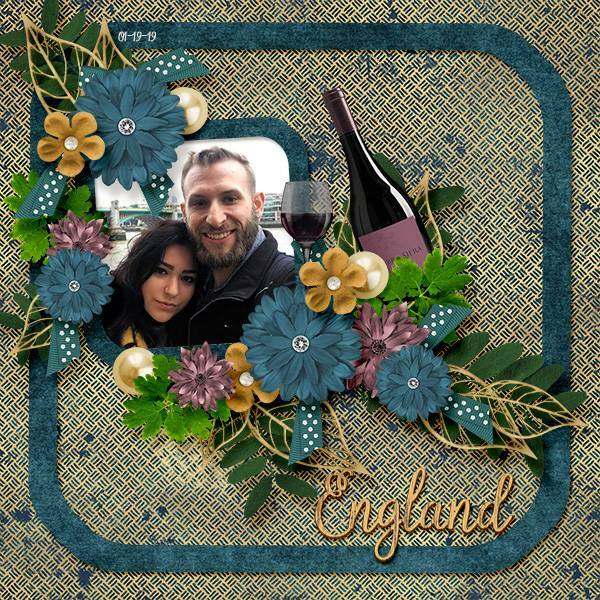 My profile picture needed some updating. 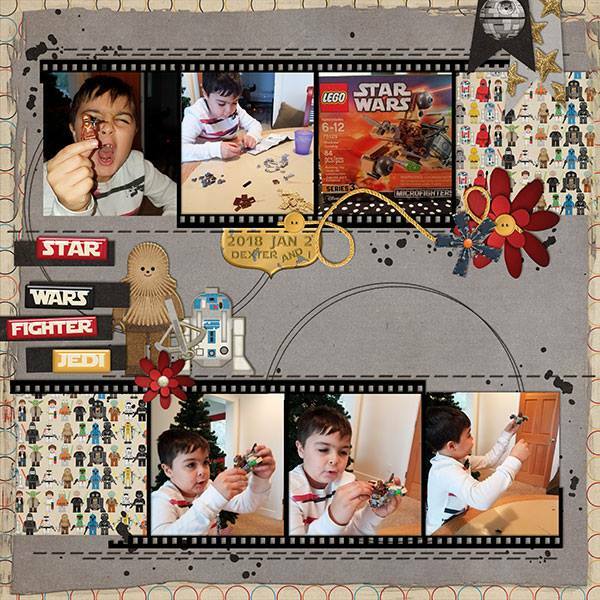 I used some really innovative templates from Bits N' Pieces and our Sumptuous kit. 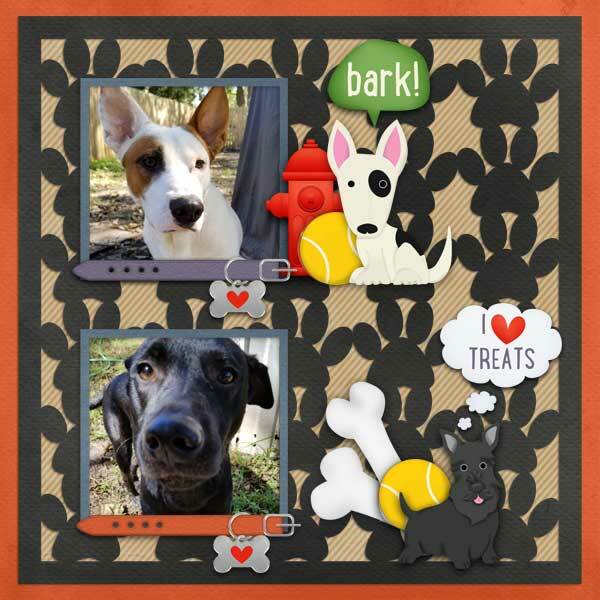 Jump over to Scrappy Sisters and check out Rachelle's awesome templates. She often includes a template for your FB wear in her templates, too. Here's a close up of Sumptuous. There are a lot of artistic pieces and stamps. I'm just in love with all of the gold. What a super luxurious feel! I'm having an absolute blast making papers lately. I'm learning to tweak my colors and the lightening much better and digging the results. 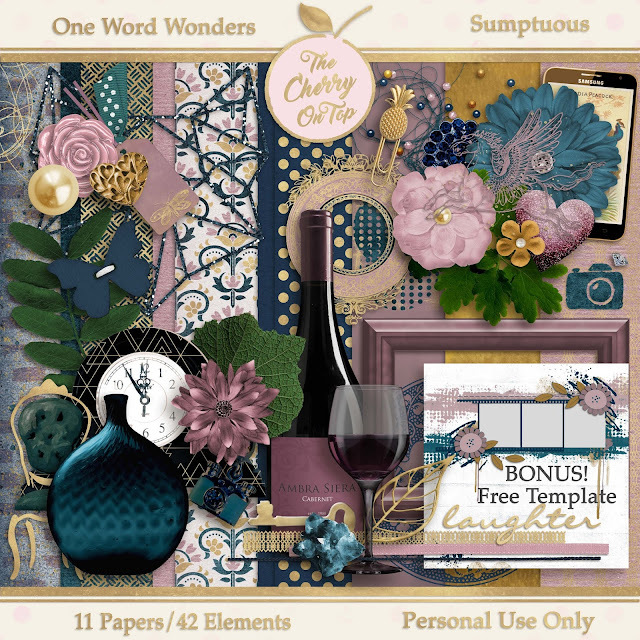 Newsletter subscribers will get a mini kit from each One Word Wonders kit as well as a coupon for 50% off. So make sure you are a subscriber. I deliver the mail every Friday or Saturday and share the most abbreviated updates and look out for's. Hehehe...It's a great way to stay current and know what's coming in the future, too. 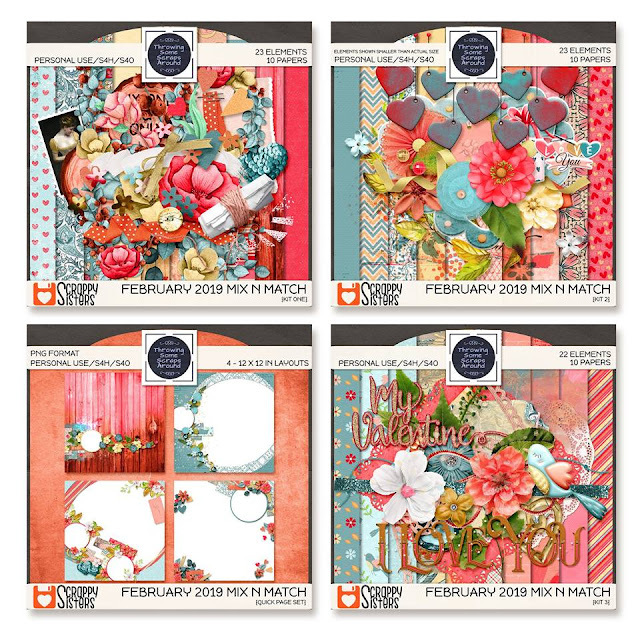 You are looking at a future template and Aimee Harrison's stunning collection February 360. I totally recommend her 360 Collections for anyone interested in timely/monthly/Project Life or Life Documented types of projects you have. The colors are so alive and the flowers so fun! I had a blast scrapping this page. Jodi from Throwing Some Scraps Around is at it again and she's got another Mix N' Match for February. The color palette is huge and I'm sure you're going to really like it. I chose a couple of the colors and used a template of hers from last week, Free Spirit. 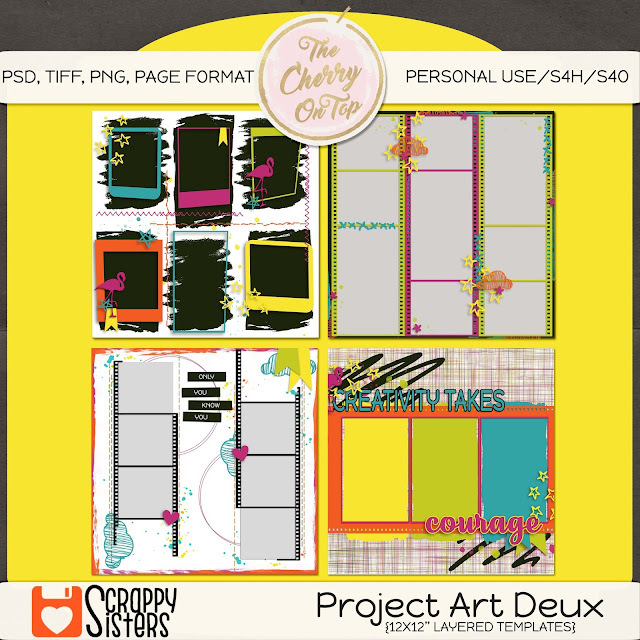 You can get all of the goodies in the Scrappy Sisters shop. 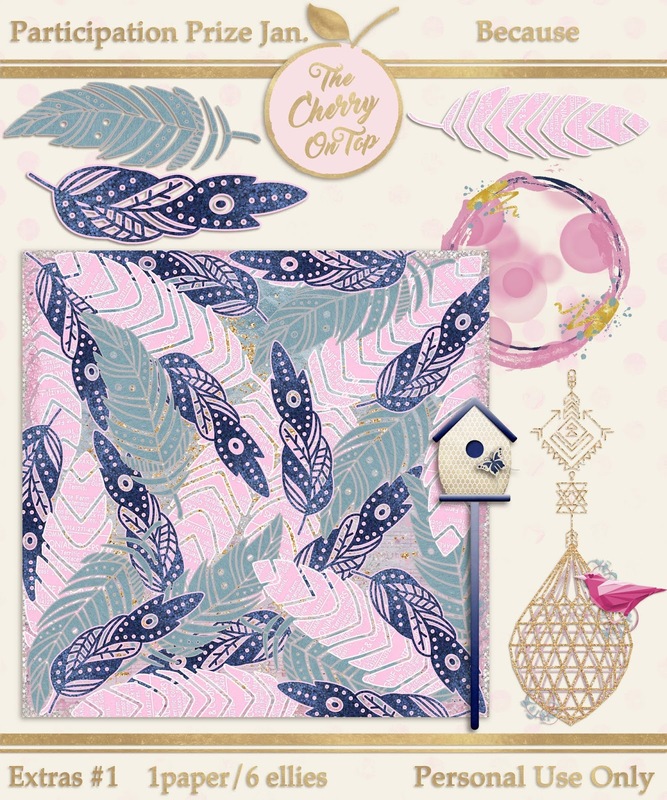 If you are a fan of The Cherry for our freebies, then let me show you some lovelies we have ready. 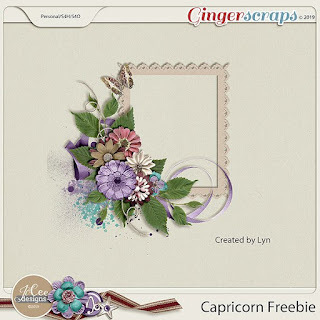 In our scrap-a-liscious group, I've got a free mini kit for the January challenge. 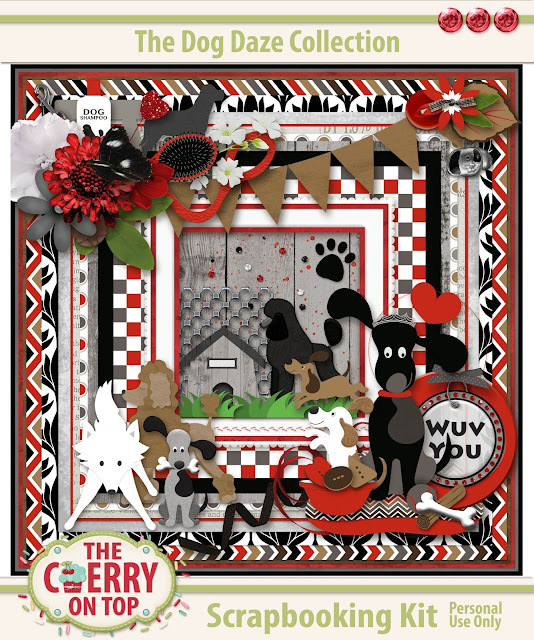 There are enough goodies in there to make lovely pages and a lot of scrappy sisters have already added their pages in the January album which qualifies them for the extra's pack which I'll be sending around at the end of the month. If your pages are not in the album by the end of January, you'll not qualify for the extras. This is what the extras are. I'd love to see what you design with the first part of Because. 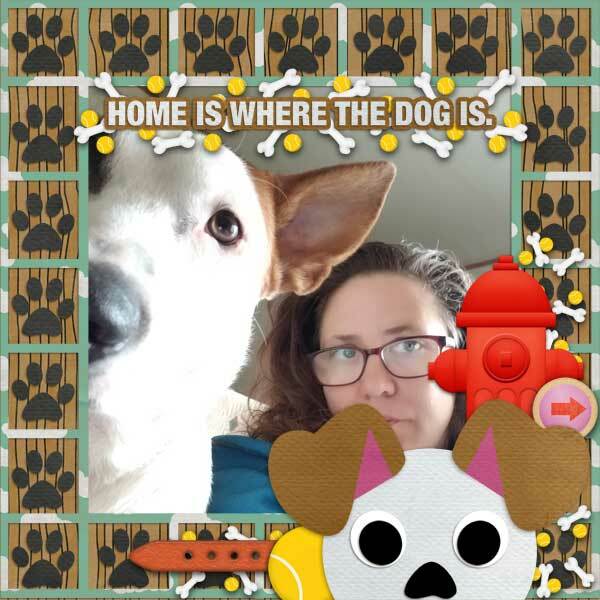 I post free stuff nearly every single day on our Page and in our group either I or other super sisters post awesome freebies that they find around DigiLand. 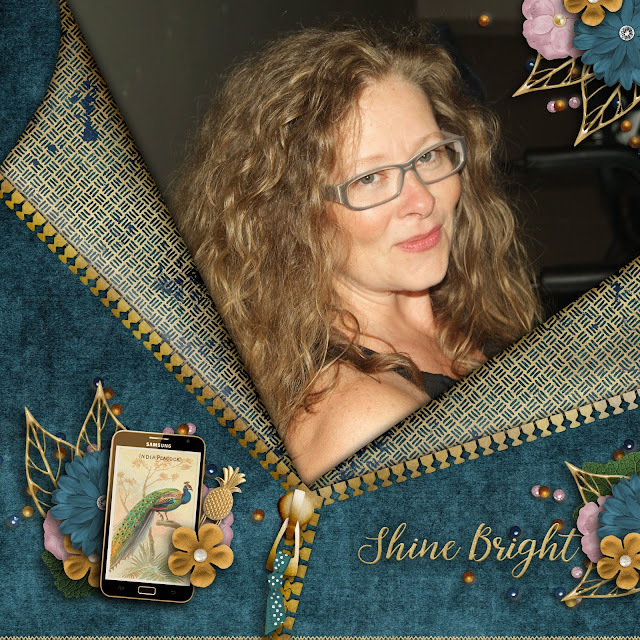 You can share your pages and projects there, too. They do not have to be digital. We'd love to see what crafty creations you've made. My gal Andrea is helping set us up with some awesome freebies. Check all of these out! 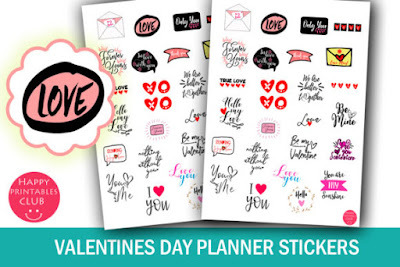 Check out ALL of the freebies Diane has for you! If you are following along with our 52 Reasons, year long project make sure you click here to get ALL of the parts. I gave them all out on our last blog so that you can whip it together in time for February 14th! Thanks so much for checking out The Cherry. I hope ya join us in all of our social spots. You can find them in the side bar. Today, I'd like to give you ALL of the 52 Reasons Why I Love You cards. I want to make sure you have them all so you can put the nose to grind and finish this before the due date, which really isn't that far away. I'm shaking a bit myself because I've not done nearly enough for how late it is. Ahhh!!!! Without further adieu, you can find ALL of the blank cards and reason 1-52 below. I'm so, so glad so many of you played along with the challenge. Please, feel free and show off what you've done with them either here in the comments with a link or in our scrap-a-liscious group on FB. Reasons 46-52 can be found here. Reasons 37-45 are right here. 19-27 can be found here. 1-18 you can find here. Here you can find the BLANK cards. I've got a video to assist you! Thanks for stopping by. 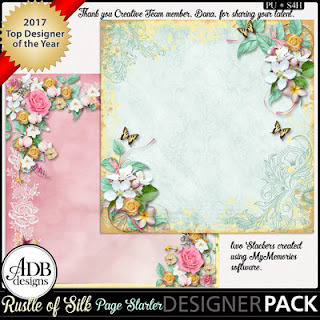 I hope you check around and see all of the other awesome cuttables, freebies, templates, scrapbooking kits, etc that have been filling this blog for years and years! I'm so thrilled it is the weekend. For us, we can finally sleep in. The kids can lounge around in their pajamas and we can enjoy our time together. We don't have to rush around to Karate or the Chess club or the gym. The weekend is typically a very needed time to unwind, relax and have quality time with each other. I hope it is the same for you. Does the weekend provide time for you to dive into your hobbies or other things you love to do? It is essential to make time to do the things you love and enjoy like reading our blogs? Hehehe...You deserve time for you so make sure you designate it. I really love designing goodies and creative things. 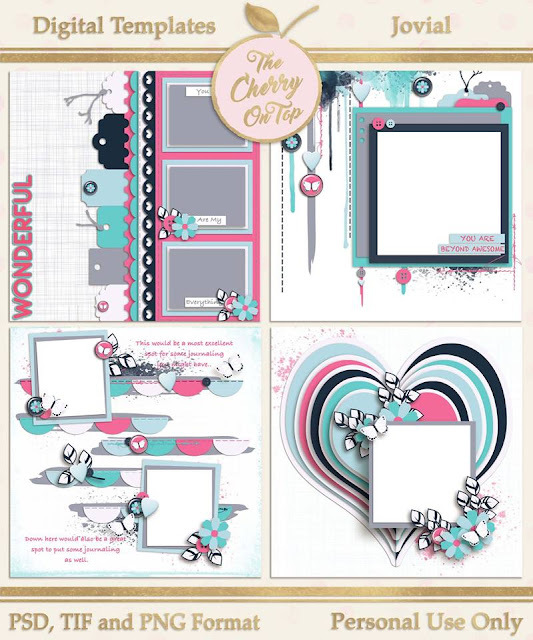 This weekend I'll be finishing up some more templates and scrapbooking with gorgeous goodies from Aimee Harrison. Hey! I did the same thing last weekend. Ha! 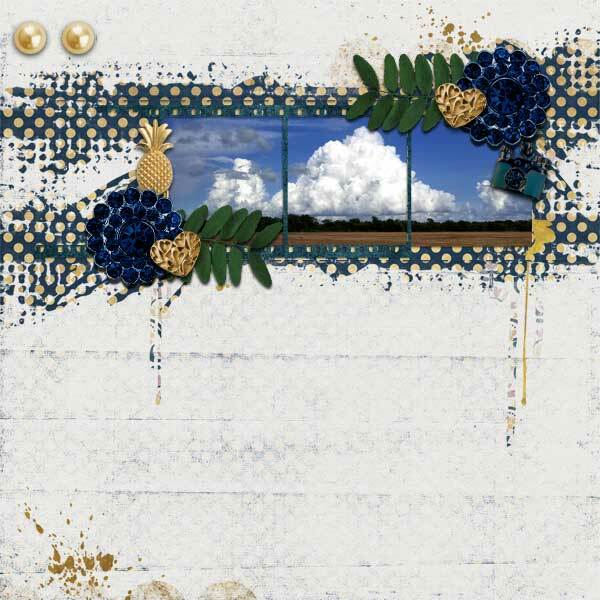 Kick up your feet, take a deep breath and enjoy today's blog full of scrapbooking inspiration. 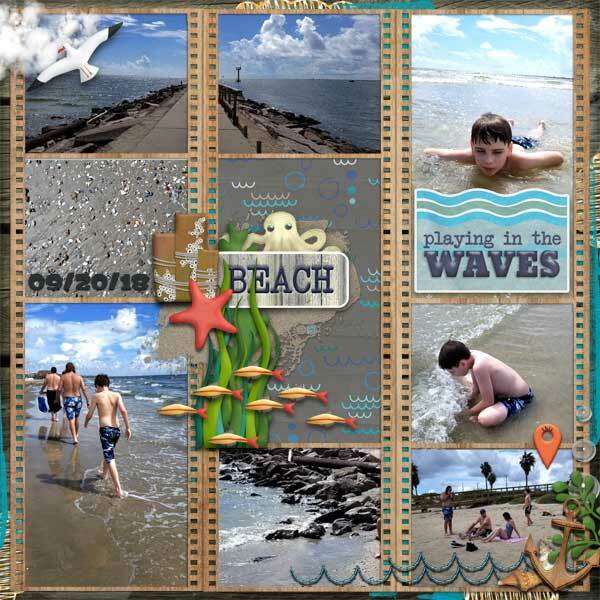 It appears that there are not enough artistic styled, multiple photo digital scrapbooking templates. I keep getting requests to make more and once again, I have obliged. I dig delving into unfamiliar waters. Paint, messy stitches, masks...they are not all that familiar to me, yet I do like the results I've gotten so far and I hope you do, too. What I found whilst playing with these templates is that they scrap incredibly fast, which is super if time is of the essence. 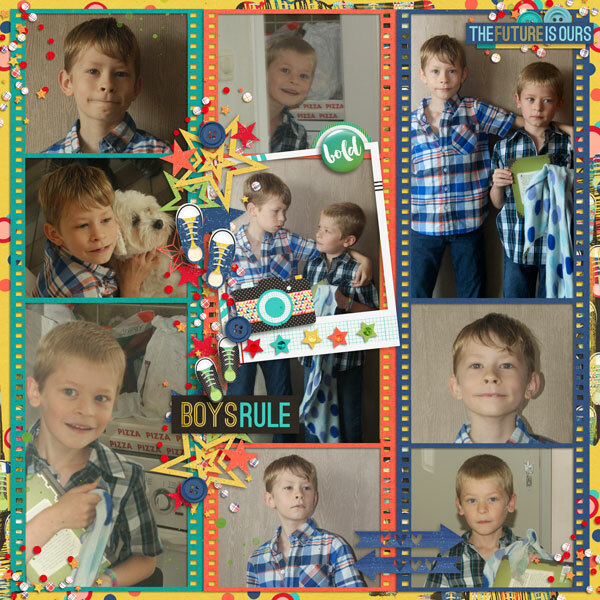 You can get a lot of pictures scrapped in minutes. You can layer up your page as much as you desire or perhaps as much as you have time for. In an ideal world, we have endless amounts of time for our pages, but for most of us, we need to get it done in a reasonable amount of time. Project Art Deux look pretty awesome with just your pictures inserted. Of course, the point is to replace our elements, but if time doesn't allow it, then clip in your pictures, print and you're set. 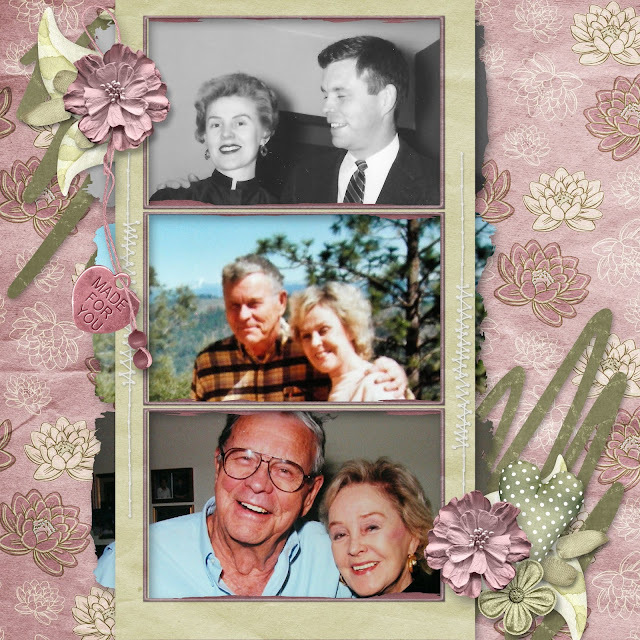 I clipped in my photographs and papers. Then I went in and added a few layers. I went back after finishing some chores and added a few more layers and was pleasantly surprised at how satisfied I was with the result, which seemed to not take a lot of my precious time. 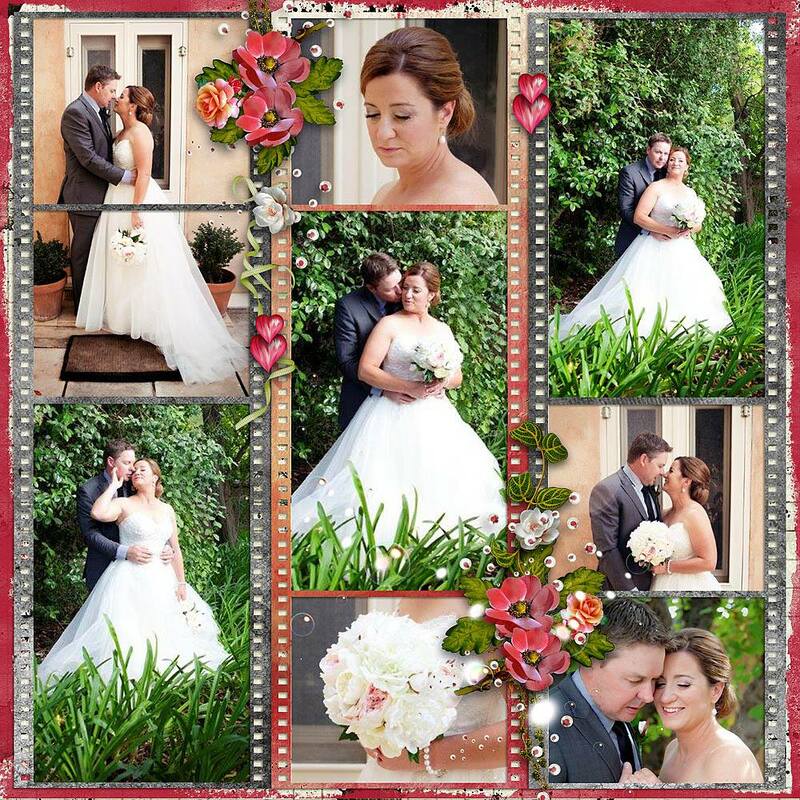 When you have a lot of pictures to get scrapped, these templates are just what ya need. There are 23 photo spots in total. Of course, you can ditch the artistic elements if they are not your thing and replace them with more traditional ones. 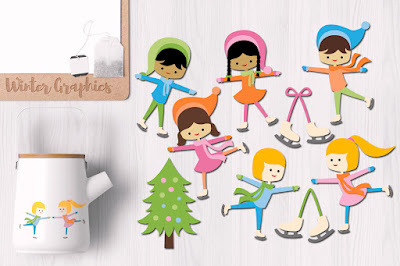 You could also add real, paper elements and traditional goodies like glitter and stickers. 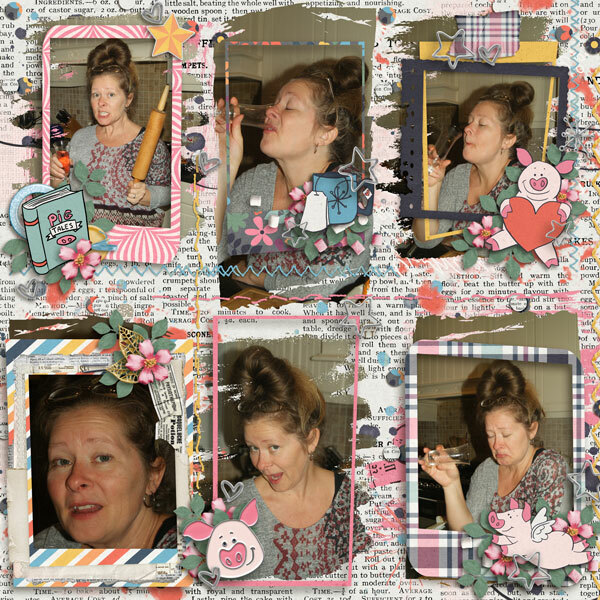 Hybrid scrapbooking is smart scrapbooking. You save time, money, your photos always fit perfectly and if you use digitally printed out items, you don't even have to leave your house. You can size everything just the way you need as well. This weekend I was at a scrapbooking event and all of the elements were geared towards a 12x12 page, but I rarely scrap 12x12 and they were mostly too large for my small, journal pages. My brain got into digital mode and I was mentally resizing them all smaller and in different sizes. Hehehe... I'll be sharing those pages next week. Let me show you what I and my team have done with these templates. There is a lot more you can do, too. I'll explain how you can switch these up as we go. Yeah, that's me. Enjoying a glass of my favorite German sparkling wine crafted from a dear friend. I was also enjoying the fact that I had 6 special needs kids in my living room who were playing so nicely, I could actually do this. What a gift we all received. The boys got to play with each other outside of school and I didn't have to totally stress because they were so well behaved and busy. 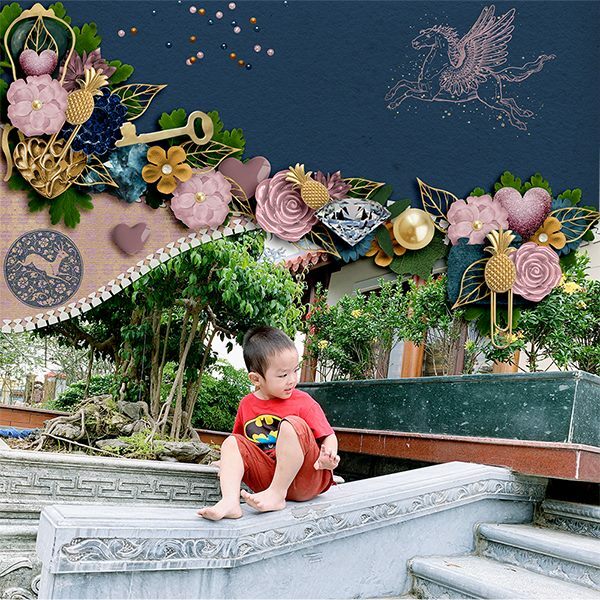 Is the collection I used from Made By Keuntje not totally adorable? I loved the colors and the doodles. 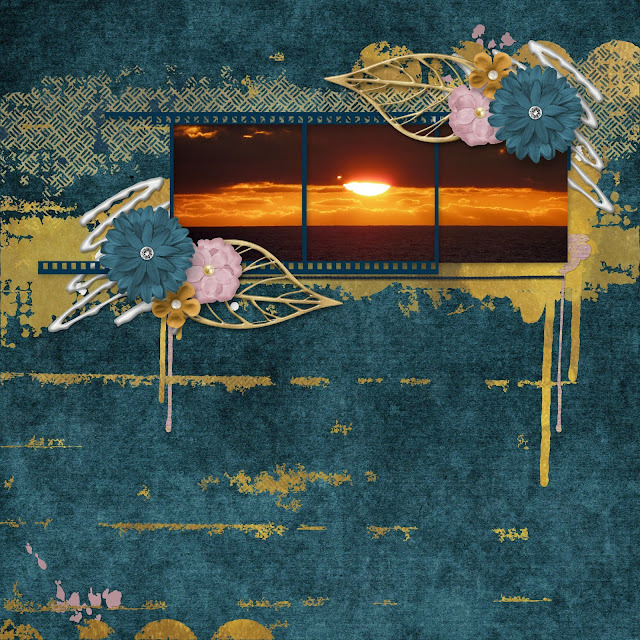 There are a nice selection of artistic goodies that went great with my template style. The piggies are my favourite part and I added as many as I could. Hehehe...Simply clip in your photos, papers and start layering up your elements. I used mostly tiny clusters spread out evenly on my page and anchored the page with Dana's lovely stamps and my template's stitches. This page is also mine. You might recognize my boys by now? Hehehe...This was one of those pages where it whipped it up in minutes flat and after long speculation, was quite satisfied with the overall look. The colours were so super. This Boy Can is from Misty Cato and you can find it in the Sweet Shoppe. Another idea you could use for this particular page in the set is to fill all of the photos spots with papers or even journal cards or both. Add some titling or journaling and no pictures needed. You could add a photo to the top of it all as well. There's so many options. Another page of mine. I've been wanting to scrap this fun shoot for a long time and the colors of our free collection Because, fit wonderfully. There are also a lot of artistic elements in Because. If you didn't grab the first, free portion yet, keep reading to find out how to download it. Rochelle's page came out so cute. 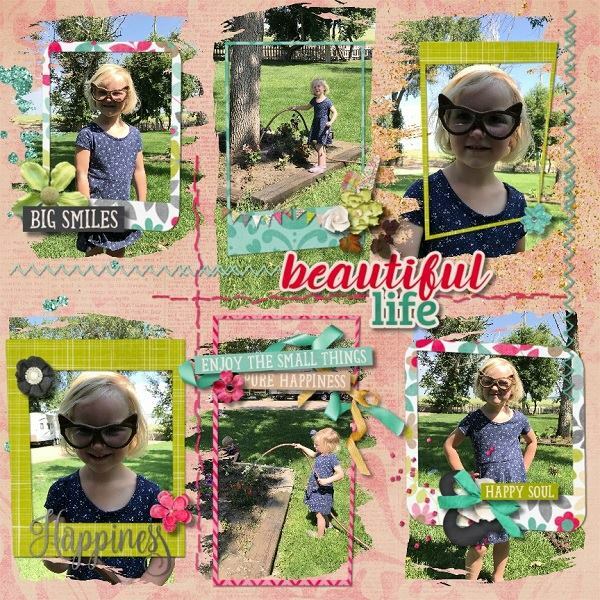 Her little girl steals the show and totally upstages my template! Hehehe...The way she designed her page, puts this little blondie center stage and the rest of the page takes a back seat. We focus on her and then we're drawn to the rest of the page as we peruse. It has a lot to do with the colors she used as well as her shadowing. When you notice that an element sticks out more than the others, ask yourself why? Is it the shadows or contrast or lack of contrast then consider what you want on your page and apply that technique. Tanja's page is a beautiful mix of an artistic style page with traditional goodies. Ngoc totally rocked the templates, as usual. She went full out traditional and kept all of the cool artistic stuff in the background. What a great result! 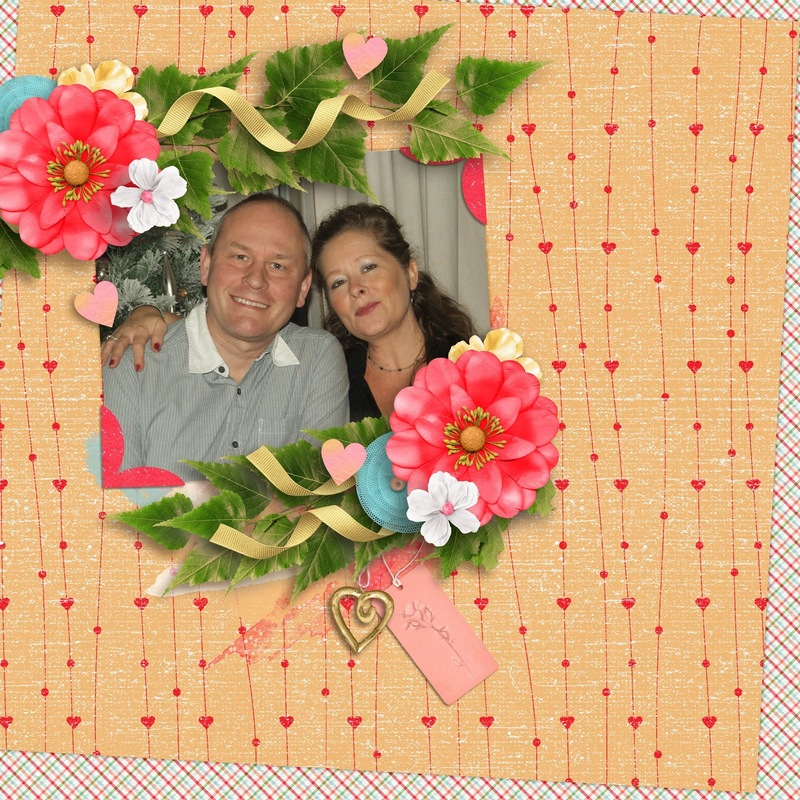 See how she used papers in some of the photo spots? She spread them out very evenly to make her page exceptional. Carol turned this template around to fit her needs. Instead of a long photo, which isn't always that easy to fill, she's got a nice rectangular spot which is much easier to fill. Check out how Kay used one photo in two spots. Another great idea! If you are loving her kit, you can find it here. 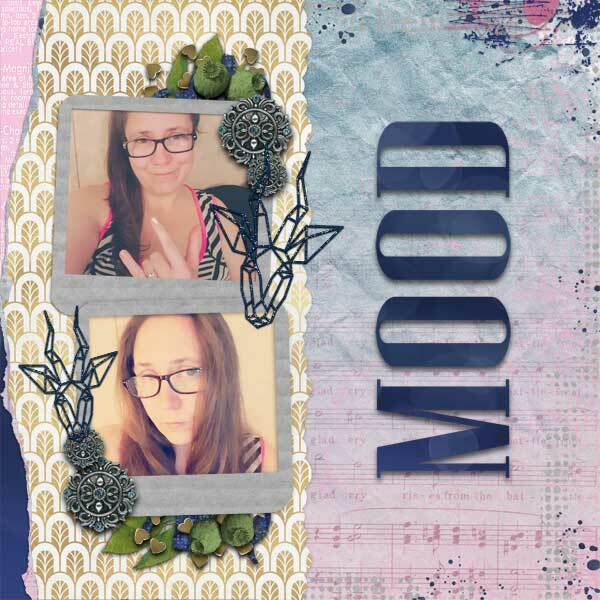 Kay from Designs By Savi played with a set of our templates, Rad Dad. What a gorgeous result?! You can find the kit she used, here. This is the free collection you'll be acquiring throughout the year. The first portion is available in our group. If you post your page in the album by the end of the month, You'll receive another small pack of products. Pages must be finished and uploaded to the correct album by January 31st to receive the extra goodies. 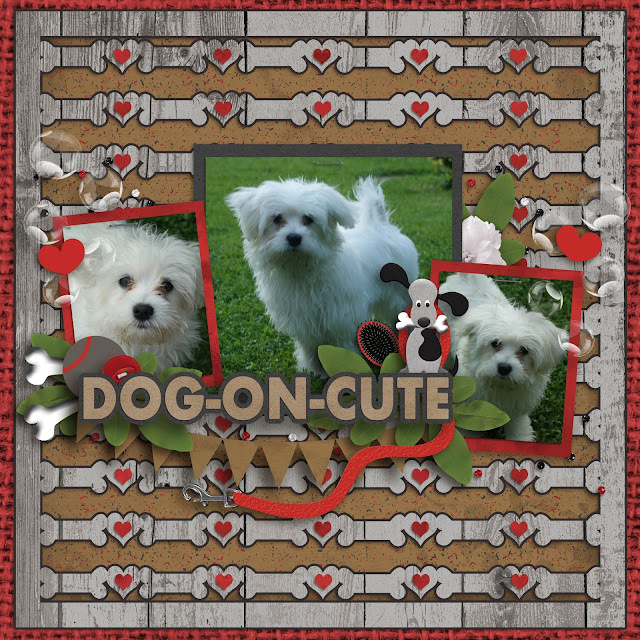 Have you done the Pixel Scrapper Blog Train for January yet? This was our contribution. Our free Commercial Use is only available for that month. You have to be fast! If you never want to miss out, then you'll certainly want to sign up for our newsletter. There are a lot of cool, free graphics to be found at Creative Fabrica. Here are two new ones. Grab them fast. They are only available for one week. They'll have new ones if you miss these. I'll be back next week with a traditional post and the 52 Reasons card. I'm considering giving the rest of the cards then, so you can get the entire book finished by February 14th. I really need to start kicking it in line! Hehehe...I'm nowhere near finished. Thanks so much for giving The Cherry a part of your busy day. I hope to see ya around our social spots. Find them in the side bar.